The so-called “gig economy”—the environment of independent, temporary workers—is growing and influencing the way that Americans view work. But it comes with some challenges, one of the biggest being that gig workers do not have access to an employer-sponsored retirement plan and the employer contributions that often go with it. Fortunately, there are four retirement savings alternatives ideal for gig workers: Individual(k)™ plans, simplified employee pension (SEP) plans, IRAs, and health savings accounts (HSAs). The gig economy generally is viewed as those workers who are independent from an employer and who work jobs that are intended to be temporary. Accurately measuring the size of the gig economy, however, is difficult because there is no official agreed-upon definition for gig employment. 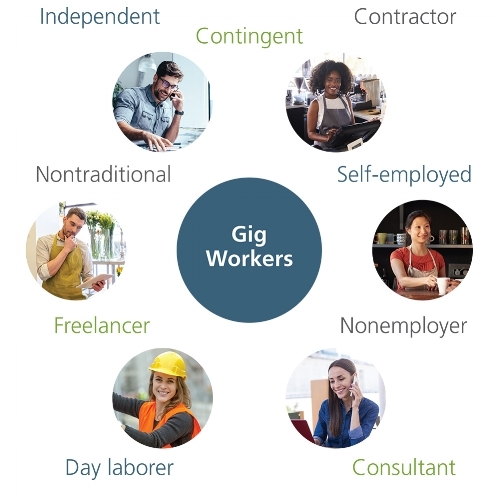 In government surveys and private studies, gig workers are classified and grouped by various names for the sampling—from sole proprietors to contingents to freelancers and more. Gig jobs can be part-time and full-time and may be available for skilled workers (transportation, construction, personal services, etc.) or may require highly-educated workers (lawyers, consultants, doctors). One driver of the gig economy in recent years is Internet technology platforms and smartphone applications that make finding gig workers and gig jobs much easier. The gig economy is not exploding by most accounts, but there has been growth in the past decade, largely affected by higher unemployment rates following the Great Recession. Studies based on narrow definitions and samplings of gig workers might estimate this group to represent 5% of the total U.S. workforce. Others that take a broad approach say more than one-third of the workforce is in the gig economy. A 2017 survey by the Bureau of Labor Statistics (BLS) put contingent (jobs not expected to last more than one year) workers in 2017 at 3.8% of total employment and alternative employment arrangements (e.g., contractors, on-call workers, temp agency workers) at 10.1% of total employment. 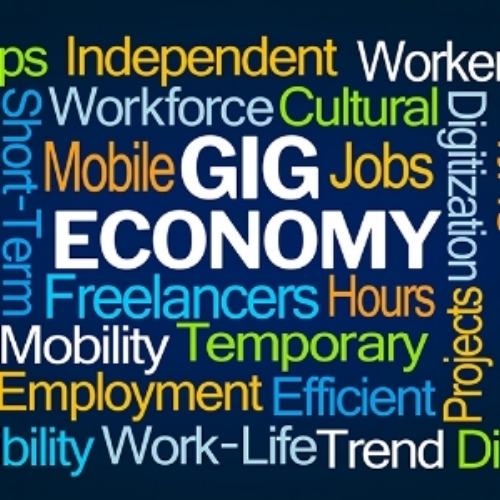 A survey by the Federal Reserve Board late in 2017 estimates 31% of adults were engaged in gig work (defined as occasional work or side jobs, including nontraditional activities: offline services, offline sales, and online services) in the month before the survey. The 2017 study by Upwork and the Freelancers Union estimates that 36% of the U.S. workforce are freelancers. This study takes a very broad approach to include anyone who has engaged in supplemental, temporary, project-based work and contract-based work within the past 12 months. The study also predicts that if the current growth rate continues, more than half of the U.S. workforce will be freelancers (if even on a small scale) by 2027. The gig economy is a draw for employers who want certain skills for short periods of time—they want to reduce fixed costs (including reducing benefit costs) and want flexibility in resourcing. Gig workers view their employment in different ways. Some view it as regular full-time work, and others as a hobby. Some are moonlighting to supplement income, and others are turning their passion into a business. Gig work appeals to many workers, but has some challenges. Many gig workers are not aware of their retirement plan options or lack the confidence to make retirement plan and investment decisions. Financial organizations and advisors can educate this growing population about some of the viable retirement savings options for gig workers, such as Individual(k) plans, SEP plans, IRAs, and HSAs. All of these provide gig workers the opportunity to save in tax-deferred accounts (reducing current tax obligations) and give them the flexibility to decide each year whether they can afford to make contributions. An Individual(k) plan is a low-cost owner-only version of a 401(k) plan. It is ideal for gig workers who want to maximize retirement contributions in good business years. It allows for larger contributions than other small business retirement plans, including pretax and/or after-tax Roth deferrals (maximum $18,500 for 2018 and $19,000 for 2019, plus $6,000 for those age 50 or older), plus contributions of up to 25% of compensation. A simplified employee pension (SEP) plan is a good option for gig workers who want less complexity than the Individual(k) plan but the flexibility still to contribute when income is good. SEP contributions are made to Traditional IRAs. The maximum contribution is 25 percent of eligible compensation up to $55,000 for 2018 and $56,000 for 2019. Contributing to an IRA is another good option for gig workers, but the annual limit generally is smaller than the limits under Individual(k) and SEP plans: the Traditional and Roth IRA contribution limit, in aggregate, is $5,500 for 2018 and $6,000 for 2019, plus $1,000 if age 50 or older. Contributions cannot exceed the worker’s gross income for the year, but can be made in addition to contributions to retirement plans. Traditional IRA contributions are tax deductible, but workers—if they or a spouse participate in an employer plan linked to other employment—might not be eligible for a tax deduction if income exceeds certain limits as described in IRS Publication 590-A. Roth IRA contributions are not tax-deductible, but the benefit of contributing to a Roth IRA is tax-free distributions, including the accumulated earnings, for qualified distributions taken before or during retirement. There are, however, contribution eligibility restrictions for Roth IRAs based on the worker’s modified adjusted gross income. Another challenge for gig workers is not having access to health insurance or the employer contributions that often go with health insurance. Many gig workers subscribe to high deductible health plans for the lower premiums, and potentially qualify to make HSA contributions. HSA savings can be distributed tax-free for qualified medical expenses before or during retirement. The HSA savings also can be used to supplement retirement income, with a similar tax outcome as Traditional IRAs; if not used for medical expenses, HSA distributions are subject to income tax and the 20% penalty tax if under age 65. Individual(k)™ is a trademark of Ascensus, LLC. Can an HSA Have Authorized Users?